The management and staff recognize that global issues are an important part of the lives of our students living in a world where economies are increasingly interdependent and global communication is a daily reality. Raise awareness and celebrate the cultural diversity and promote cross cultural understanding. Increase our school campus beyond the school boundary. foster contacts with the international world and broaden school curriculum relating it to global issues and sharing best practices and teaching pedagogy with other schools of the world. develop respect for democratic ideals, peaceful tolerance and conflict resolution amongst our students. organize regular celebrations of our rich and diverse heritage. celebrate UN International days and years and events of global importance. The Commonwealth School Enterprise Challenge is a unique international business competition for school students, aiming to identify and reward the social entrepreneurs of tomorrow. This challenge is supported by TEACH A MAN TO FISH, an international education charity. We decided to be a part of school enterprise challenge because : School is a very important place of our lives, in its campus we can be a part of different activities which make us ready for real life challenges and future professional lives. Entrepreneurship skill is very helpful for the survival and advancement of both large and small businesses. This activity will help raising awareness of career option in entrepreneurship amongst us. This activity will bring empowerment, self actualisation and development of following 21st century skills like - Ambition, persistence, creativity, risk taking, tolerance, personality, communication, leadership, adaptability (adaptability to technology, market trends, financial pressures, customers/members etc. ), intuition & vision. With the present unemployment scenario, it is important that we students should learn how to run our own business, earn and employ others in future. So this activity is helpful for the nation as a whole. For the above challenge our school students meticulously developed a business plan, launched it, became a part of every aspect of business from market research, production, finance, advertising, sales, HR etc, in the school premises itself. We are earning profit for the fulfilling our social responsibilities and our business is a sustainable endeavour. We regularly set up a STAND TALL COUNTER displaying and selling the following products (Chocolates & Brownies; Scarves & Stoles; Best out of waste items, Manure, Jute decorative articles & Candles) on every school event, PTM and functions. These articles are sold and profits generated is being used for the welfare and education of girl child. UKIERI has played a pivotal role in establishing a step change in the educational relations between the two countries. In recognition of the substantial achievements and building on the success of this initiative, the programme has been extended for 5 years from 2011 to 2016. The extension was announced by the UK Prime Minister Mr. David Cameron and Indian Prime Minister Dr. Manmohan Singh in July 2010. Our school teachers applied for its India UK Staff Exchange Programme, we are proud to share that Ms.Sneh Verma (Principal of the school) and Ms.Preeti Sharma (TGT) won UKIERI staff exchange visit grant of GBP 3000 each, i.e. total 6000pounds to conduct our visit to our partner school in UK, School - OLD DALBY Church of England Primary school, Leicestershire, Melton Mowbray, UK. With the help of grant we will visit the school and share and deliver best practices on curriculum and pedagogy and learn from each others system. The programme would work for enhancing capacity of teaching staff to further cascade and implement the learning's from each others education system. 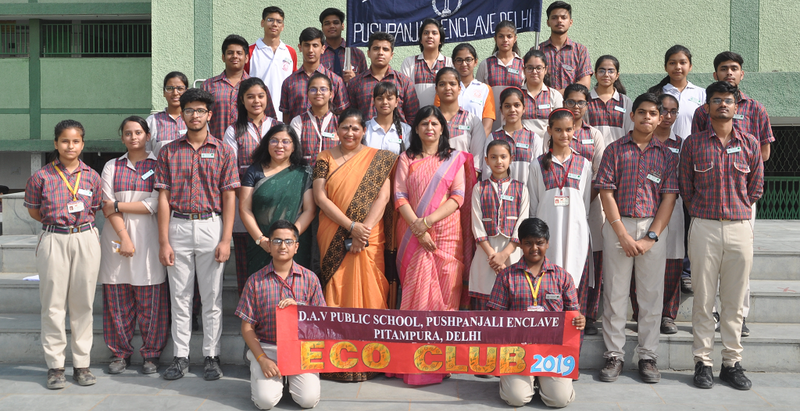 Our school and partner school has come alive with both these ongoing projects and both our students are learning from each other and are associated with global issues of Sustainable development, globalization, world peace, human rights, social justice etc. ThinkQuest is an online learning platform that helps students develop important 21st century skills, including communication, critical thinking, and technology skills. We have around 1000 students and teachers as members of his community. We regularly participate in all local and international competitions organized by thinkquest. Our 44 teachers designed curriculum based projects for TQ international competition 2011 with 300 students participating in this competition. Similarly for this year we are sending around 55 entries of educational projects and websites for thinkquest international competition 2012. Now thinkquest is transitioning but Oracle will host a Java competition, Oracle will expand the Oracle Academy, which currently supports 1.5 million students in 95 countries, with more services for schools and a new Java offering for hundreds of thousands of students. Oracle Academy curriculum will continue to include project-based learning activities. For example, Oracle's database students are required to develop a data model for a database that might be used by a school or business and Oracle's Java students will be required to develop an actual Java application. We are already a part of this new transition and will continue with this change.The aim is to innovate education and provide new experiences to our students. I. 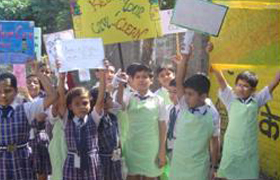 The Grand Banyan Project:-an initiative of the British Council in collaboration with the NGO, I Love My Mother Earth (ILMME) Foundation had 200 schools from across India involved in one of the biggest paper recycling projects. The project involved three specific activities - campaigns to collect waste paper to produce notebooks for disadvantaged children; cleanest day drive and cover design contest for the notebooks. 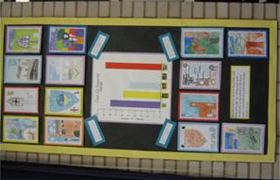 Our school participated in all the three activities. 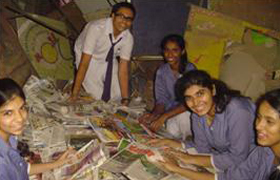 We collected 1500 kg of newspaper which generated 600 notebooks for the disadvantaged children. II.The Languages for the Games competition:- provides opportunities to schoolchildren globally to show their creativity in a second language while carrying out a task about Paralympic sports and values. Participants must create a short multimedia online presentation which can be viewed over the web and on mobile devices. Our students are participating in the competition and making presentation and poster on their paralympic hero. 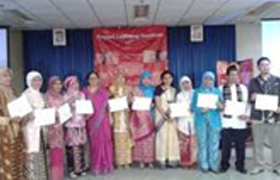 The students were also invited for the designing of multimedia presentation for the same at the Brtisih council of 18th and 9th April 2012. III.TWIN 2012:-The London Olympic Games are all about international friendship and bringing people together. Twin for 2012 enables you to take the first step and get pupils connected with fellow students in another country. The students are able to get in touch with their international peers and work together on joint projects. 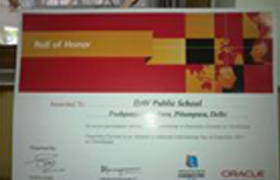 Our school is registered for the same and is already collaborating with our international partners. IV. 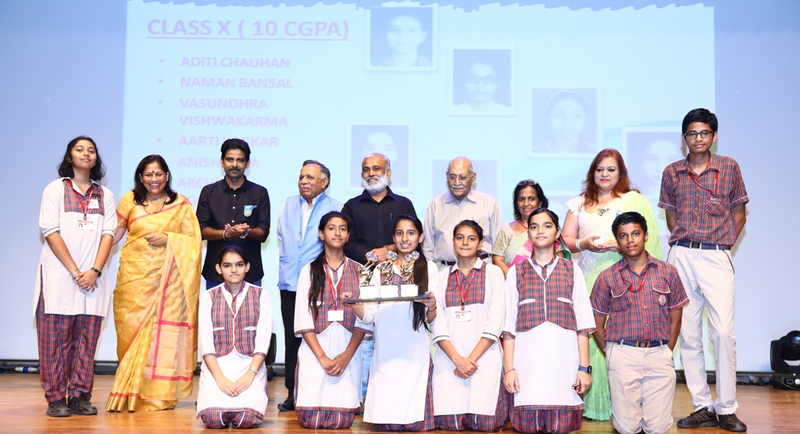 GLOBAL GATEWAY - Global School Partnership:- Global School Partnerships (India) invites nominations for GSP partnerships that are exceptional examples of sustainability, innovative projects on global issues, effective use of technology. Since 2003, GSP programme has facilitated over 500 partnerships between schools in India and the UK with the aim to promote global education through the curriculum. We were the members of Global Gateway the details of partnership are: We partnered with Cotsford St Luke Primary School, Somerset, UK. We made our students epals and designed lot of collaborative projects with them to save bio-DIVERSITY, students worked on Project - "Are humans going the dinosaur way". It was a great learning experience, involved lot of field work, surveys interviews and students learnt while playing. V. INTERNATIONAL SCHOOL AWARD:-The British Council International School Award (ISA) is an accreditation scheme that recognizes and celebrates exemplary practices of internationalism in schools. ISA provides a framework for schools to develop an action plan and implement international activities throughout the year, and encourages schools to collaborate with overseas schools to create a rich learning experience for students through use of ICT, creative pedagogical practices and real context for learning. Our action plan was highly appreciated and approved without any change and we will be submitting the dossier by february2013 to complete our application for the award. The school is brimming with the activities integrated in curriculum having an international dimension which are mentioned in our action plan. We aim to concentrate on all round development of the students thereby linking their lives to the world and issues outside their school campus. Face to Faith is an innovative schools programme for 12-17 year olds, which is active in 18 countries and growing. 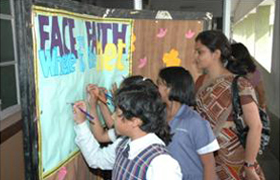 Face to Faith connects students worldwide via a secure website where they interact. The programme features facilitated videoconferences where students discuss global issues from a variety of faith and belief perspectives. Through Face to Faith, students gain the dialogue skills required to prevent conflict by breaking down religious and cultural stereotypes. Has promoted cross-cultural understanding - equipping our students with key 21st century skills needed to live in a world of diverse faiths and beliefs amongst our students. Is providing our students with the knowledge, skills and competencies needed for meaningful inter and intra-faith dialogue across a range of cultures, containing diverse and often conflicting views. Is giving our students key mediation and negotiation skills so that they are able to hold meaningful and respectful interfaith discussions-even if their views diverge. I. 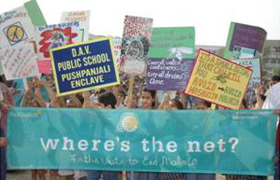 We are a part of global anti-malaria campaign "Where is the net?" launched by this Tony Blair Faith Foundation. This is an initiative to raise awareness of malaria and increasing the use of bed nets, which can protect lives. The net will travel across the world and will be in India from March 15 to 2nd week of June. 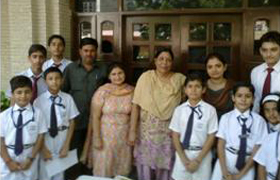 Our school was selected to be the net bearer, and hosted the net on 2nd April 2012.
a.Principal Ms. Sneh Verma addressed and informed the students about the Where is the net campaign and generated awareness about the UN Millennium development goal to control malaria and generate awareness of using malaria nets to control the disease. b. A Speech was given by K.V Smitha, a student of class-XI to discuss facts, myths, geographical distribution of malaria affected areas, causes, preventive measures. It was very informative for the students. 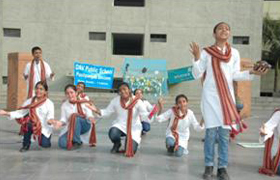 c. A NUKKAD NATAK (Street Play) was performed by the students of class-IX to enlighten their fellow students about Malaria and where is the net campaign. d.The MALARIA NET was showcased at the central place on the stage which was visible to the whole school. Tying of Luggage tags with messages were started by Principal madam then the representatives of all the classes from II to XII started tying their luggage tags with the messages. We hope that our tags will win more nets for the needy. e."The Thought wall":- the students of class - IV shared their thoughts, knowledge on the Malaria thought wall related to the campaign. They researched their ideas and shared their faiths and beliefs on the topic. f.The Malaria quiz was conducted for class - VIII students to test their knowledge on the topic. 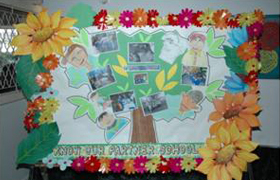 g. A Poster Making was held for the students of Class - XII on 28th March 2012. It was a great experience for us to be a part of such an event where students became a part of the problem and solution. The whole event inculcated twenty first century skills amongst our students and showcased the unity of faith to join together and control one of the problem of the world. 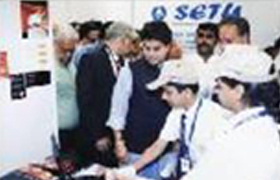 interact with many well known personalities from various fields. share their experiences with Face to Faith. participate in panel discussion by various faith leaders. The two students representing the school gave 5 minute presentation on "Face to Faith" day celebrations at our school and hence should come prepared. Multimedia facilities would be provided. 1. Al-Sawya Secondary Girls School/Wafa Ahmad. 3. 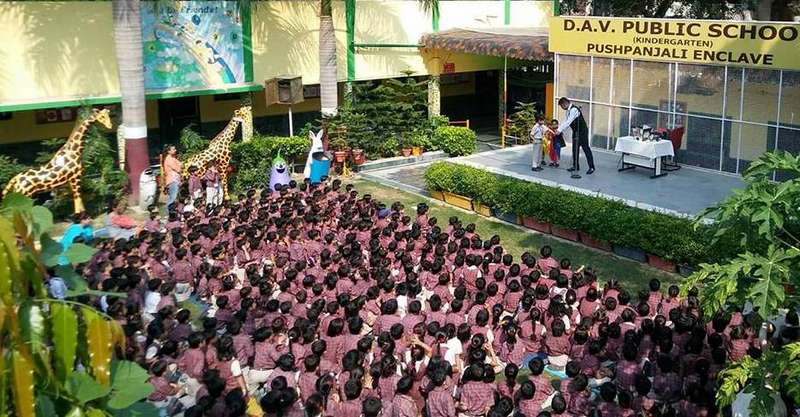 DAV Public School Pushpanjali/Preeti Sharma. 4. The Indian Heights School/Ms. Madhumita Mukherjee. 5. 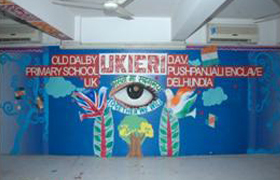 DLF Public School/Vidhya Sumesh. 6. Xavier School/Mr. Chris King de la Cruz. The two speakers for the session were: Mr Abu Nada and Mr Shedaha from Help Age joined as experts the video conference. We invited elderly members from the community and our students participated in the conference. V. We also participated in faith friends competition Many students wrote blogs about their friendships describing own struggles with the idea of "faith" itself. We are also the part of 3rd Faith Shorts global film competition for students. Our school students are making film on how their faith inspires them for the competition.